Q. Requirements for online registration? • You must have bank account in Union Bank of India Or Punjab National Bank with internet banking facility. • Photograph of size 100X100 in jpeg/gif format. • Scanned copy of your signature of size 23X70 in .jpeg/gif format. Q. Who is eligible for online registration? 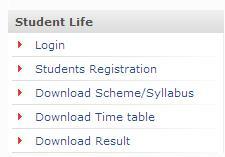 All the students who are enrolled in Rajiv Gandhi Proudyogiki Vishwavidyalaya are eligible for online registration. Q. What is the portal registration fee & Annual Subscription fee? Q. How I will receive my login credential? After the online registration process, you will receive an email from register@crispindia.com. Please check your spam filter as the mail may reach to your spam mail folder. Q. What are the payment options available on University Service portal? Initially Internet Banking facility from Union bank of India and Punjab National Bank are available. Q. Where do I get the help & support?